THANKSGIVING DAY OR TURKEY DAY? Have you noticed that many people now refer to Thanksgiving Day as "Turkey Day"? Why? Maybe Romans 1 gives us the answer. "Although they knew God [through creation], they neither glorified him as God nor gave thanks to him" (Romans 1:21). Mankind refused to give thanks to God for earthly blessings, such as sunshine, rain, and harvest. Instead, they "worshiped and served created things rather than the Creator" (v. 25). Sadly, Thanksgiving has become a day when people worship a created thing (a turkey) rather than the Creator. Many people don't want to give thanks to God for the good things in their lives. They’re like Bart Simpson, who prayed, "Dear God, we paid for this stuff ourselves, so thanks for nothing." Before the Israelites entered the promised land, they were warned, "Beware lest you say in your heart, 'My power and the might of my hand have gotten me this wealth.' You shall remember the LORD your God, for it is he who gives you power to get wealth" (Deuteronomy 8:17-18). We sometimes need to be reminded that "every good gift and every perfect gift is from above" (James 1:17). "Always give credit where credit is due." Inasmuch as the Great Father has given us this year of an abundant harvest of Indian corn, wheat, peas, beans, squashes, and garden vegetables, and has made the forest to abound with game and the sea with fish and clams, and inasmuch as He has spared us from pestilence and disease, has granted us freedom to worship God according to the dictates of our own conscience. Now I, your magistrate, do proclaim that all ye Pilgrims, with your wives and ye little ones, do gather at ye meeting house, on ye hill, between the hours of nine and twelve in the daytime, on Thursday, November 29th, in the year of our Lord One Thousand Six Hundred and Twenty-Three, and the third year since ye Pilgrims landed on ye Pilgrim Rock, there to listen to ye pastor and render thanksgiving to ye Almighty God for all His blessings. On January 31, 1957, the Canadian Parliament proclaimed: "A Day of General Thanksgiving to Almighty God for the bountiful harvest with which Canada has been blessed ... is to be observed on the second Monday in October." The tradition of Thanksgiving was born out of the realization that all good things come from God and that He deserves our gratitude. Psalm 100 is "A Psalm for Giving Thanks." Make a joyful noise to the LORD, all the earth! Serve the Lord with gladness! Come before his presence with singing! (vv. 1-2). WHY? 1. The Lord is God. Know that the LORD, he is God! It is he who made us, and we are his; we are his people, and the sheep of his pasture (v. 3). The Lord is (1) the Creator to whom we belong and (2) the shepherd on whom we rely. Enter his gates with thanksgiving, and his courts with praise! Give thanks to him; bless his name! (v. 4). WHY? 2. The Lord is good. For the LORD is good; his steadfast love endures forever, and his faithfulness to all generations (v. 5). How is the Lord good? (1) He has proved His love for us and (2) He has promised His faithfulness to us. How did God prove His love for us? By the cross of Christ. "God shows his love for us in that while we were still sinners, Christ died for us" (Romans 5:8). We are not entitled to the goodness of God. It is only by grace that God pours out blessings upon us. "Blessed be the God and Father of our Lord Jesus Christ, who has blessed us in Christ with every spiritual blessing in the heavenly places" (Ephesians 1:3). Therefore by Him let us continually offer the sacrifice of praise to God, that is, the fruit of our lips, giving thanks to His name. But do not forget to do good and to share, for with such sacrifices God is well pleased (Hebrews 13:15-16). Priests – "You are ... a royal priesthood" (1 Peter 2:9). Temples – "Do you not know that your body is a temple of the Holy Spirit within you" (1 Corinthians 6:19). Sacrifices – "Present your bodies as a living sacrifice" (Romans 12:1). Leviticus 7 gives instructions about the "thanksgiving sacrifice" (v. 12). This sacrifice was a voluntary sacrifice given after a sacrifice for sins had been offered. Today, Christ has offered the only sacrifice that truly washes away our sin. Filled with gratitude for this sacrifice made on our behalf, we then offer our sacrifice of praise. Sacrifices of praise are to be offered "continually." "Give thanks in all circumstances" (1 Thessalonians 5:18). Sacrifices of praise should be accompanied by sacrifices of good works. God isn't satisfied with our words alone. He also desires our works. Thankfulness begins in the head ("know that the Lord, he is God"). 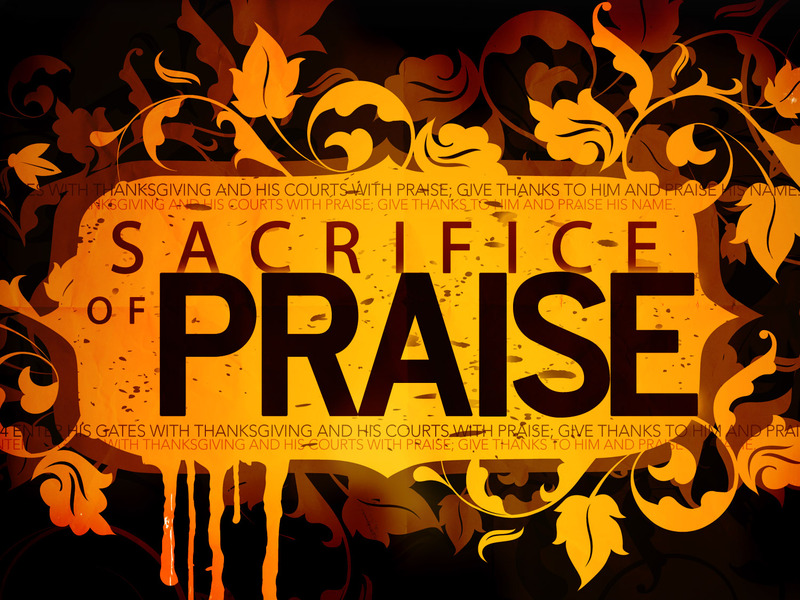 Then thankfulness works its way into the heart ("sacrifice of praise"). Finally, thankfulness affects the lifestyle ("do not forget to do good and to share"). Both kinds of sacrifices are pleasing to God. Paul wrote that the gift that the Philippians sent his was "a fragrant offering, a sacrifice acceptable and pleasing to God" (Philippians 4:18). 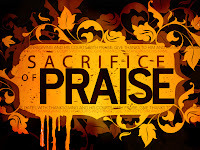 In light of the sacrifice of Christ, we must not deny God our sacrifices of praise and good works.